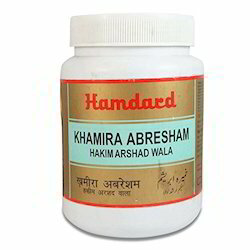 Providing you the best range of khamira abresham hakeem arshadwala with effective & timely delivery. Abresham Muqarraz, Ood Hindi Saeeda, Balchhar, Post Turanj, Qaranfal, Dana Illaichi Khurd, Burada Sandal Safaid, Sazaj Hindi, Rub Anar Shirin, Rub Behi, Rub Seb, Shakar Safaid, Shahad, Sat Leemun, Ambar Ashhab, Natroon Banjawi, Shaakh Marjaan Saeeda, Kahruba Shamai Saeeda, Marwareed Saeeda, Yaqoot Saeeda, Yashab Sabz Saeeda, Zafran, Mastagi, Arq Kewra, Warq Tila, Warq Nuqra. It gives strength to heart and brain and specially useful to treat general debility, mild hypertension, palpitation, angina pectoris, depression and stress etc. 5 grams to be taken in the morning with or without 250 ml of milk. Looking for Hamdard Churan ?